Check out the great interview in the October issue of Opal Magazine. In the interview I talk about the Flashback trilogy, including Flashback, Twisted Fate and Parallel Destiny, upcoming projects, the writing process and more. Opal Magazine published by Opal Publishing. 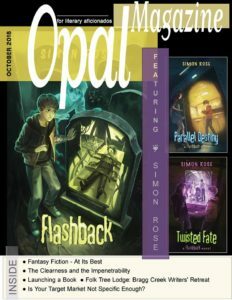 Opal is a monthly digital magazine published 12 times a year. The magazine features local authors, interviews, fiction, poetry and prose. You can read the interview and also the great review of Flashback here.